Patrick CONNER was the first to settle in the township. He was a noted hunter and trapper. This was about the year 1820. Mr. JAMISON, from Tennessee, settled on section 9 in 1821. He was killed by the Indians in 1823. Jamison Creek received its name from this pioneer. A man named Tadlock settled on the old state road about the same year. Leonard P. PILES, a Tennesseean, moved here in 1822. He was a great hunter, and removed to Missouri in 1829, on account of scarcity of game. He died in 1872. 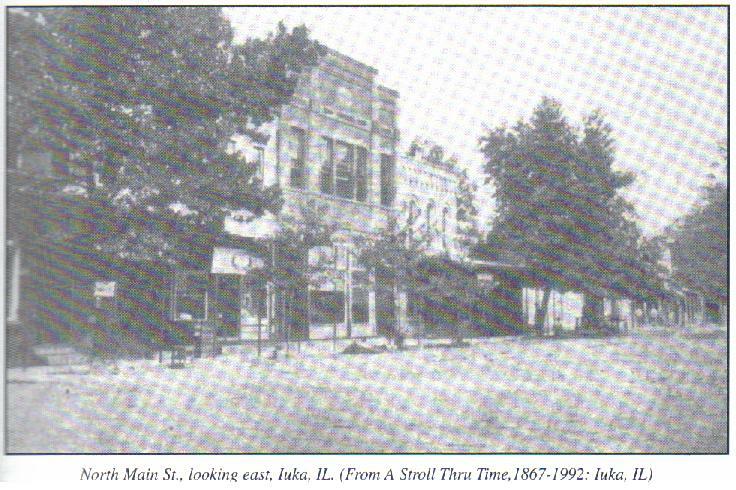 Five of his grandchildren reside in this county--two in Iuka township, the wives of William JONES and B. F. MIDDLETON. About the year 1825 Jesse TINKLER, a native of Indiana, came here. In the year 1829 Solomon SMITH, wife, and six chidlren came from Lincoln county, Tennessee, in a four-horse wagon, locating first near Salem; afterwards came to this township. He died in 1846. His son, M. M. SMITH, in 1841 located on section 8. 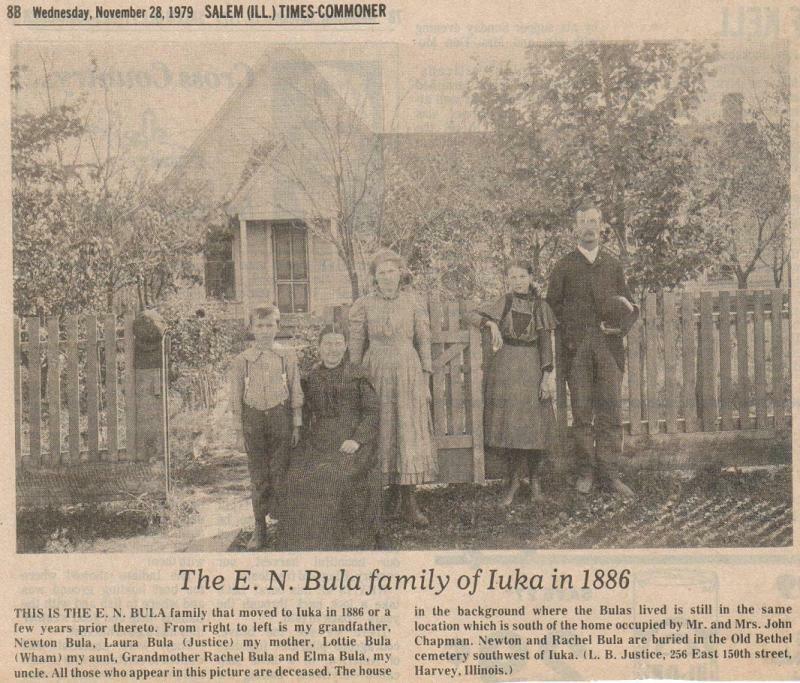 He now occupies the first dwelling-house erected in Iuka. 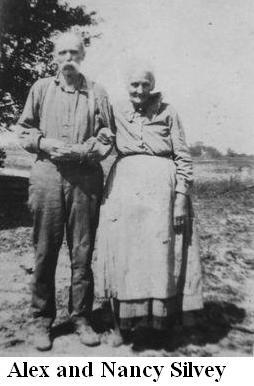 George McGUIRE, wife Ann, and eight children left their home in Tennessee in 1829. They stopped during the winter on Tennessee prairie, and the next year settled on section 8. He died in 1833; she died of cholera the same year. Their children, Sarah SMITH, Cowan BARR, and Abner BARR are now living in Jersey county, Illinois; Elizabeth LAUTERMAN in Lawrence county; Thomas McGUIRE, wife and eight children live on section 20. He has resided here since 1829. Thomas L. MIDDLETON, who was born in North Carolina, and reared in Tennessee, removed to this state in 1831. The journey was made in a six-horse wagon, and they--for there were several in the company--barely escaped with their lives in crossing the Ohio. They settled in Haines township for a time, and in 1834 located on section 7. Thomas L. was a great hunter, as well as preacher and physician. He died in 1876, age 77 years. His family was composed of four sons and four daughters. The latter are all dead. One of the sons resides in this township, and the other in Omega. His son, B. F. MIDDLETON has in his possession a gun with which his father, in fifty-one shots, killed forty-seven deer, showing that he was an expert marksman. John B. MIDDLETON, in the winter of 1831-32, with a wife and three children, moved from Tennessee, and stopped for one year or more in Little Prairie, settling, finally, in 1833, on section 19. His wife died in 1850, and he in 1879. Two of his children survive. Alfred, the younger, lives in Texas, and D. J. in section 18. Seven brothers lie buried in Fulton grave-yard, Hines township. Denning BAKER, a Tennesseean, came here with a wife and family of seven children in 1832. His third wife only survives. In 1838 Thomas CHAPMAN, also from Tennessee, came to the county, and died in 1872. Ten out of twelve children are living. One, J. W. CHAPMAN, is a prominent farmer of this township. On Ramsey's Prairie, in 1837 or '38, Rolling MATTINGLY, from Tennessee, settled on secton 24. He is said to have been the first hatter in the county. About the same time Jesse BREESE, who was a great hunter and manufacturer of wooden mold-boards, located on section 24. James SONGER settled here very early on section 25. He was from Indiana, but a native of Virginia. John LITTERAL, Oram DAGGETT, and John W. EBLIN were early settlers on the same prairie. Edward YOUNG, a native of Tennessee, came here from Indiana in 1820, with a wife and six children. He first settled two miles south of Salem; then in Stevenson, and finally in 1842 located on section 13, where he died in 1876, being 73 years of age. W. J. YOUNG, the oldest of the family, lives in section 13; E. J. in Minnesota, and Sarah with her mother. Joshua HOLLIDAY was born in North Carolina in 1817; in 1826 moved to Indiana; to Clay county in 1841. The same year he settled permanently on section 25. He reared a family of fourteen children. Mariah HOLLIDAY and daughter, Permelia, from Indiana, in 1830, moved to this township, where the mother died in 1869. The daughter, Permelia, is now the wife of Cyrus VAUGH, and resides on Sec. 23. Curburt CHEELY was born in Virginia, and resident of Tennessee sixteen years. He enlisted in the war of 1812. In 1832 he came to this township and settled on Sec. 16. He was killed in 1868, by a runaway team. His wife, Lidia P. CHEELY, nee MIDDLETON, died in 1872. Charles CHEELY, the only child living in the township, was born in 1836, and has lived within one mile and a half of the old homestead ever since. Land Entries--Sept. 1 1824, Leonard P. PILES, W. half N.W. quarter Sec. 9, 80 acres. Sept. 11, 1836, Jesse TINKLER, S. E. quarter N.E. quarter Sec. 12, 40 acres. June 27, 1836, Thomas HOW, S.W. quarter S.W. quarter Sec. 6, 40.03 acres. June 27, 1836, D. BAKER S.W. quarter N.W. quareter Sec. 8, 40 acres. Dec. 2, 1836, Seneca SPARLING, N.E. quarter S.E. quarter Sec. 6, 40 acres. Feb. 11, 1837, John B. MIDDLETON, N.E. quarter N.E. quarter Sec. 19, 40 acres. March 4, 1837, James SONGER, S.E. quarter S.E. quarter Sec. 26, 40 acres. The First School was taught by Cinthia COOPER, about the year 1841, at String Town, in a log house. This was a select school. The first school-house owned by the district was in what is now called District 2. The building was made of split logs, 16x18 feet, and had been p reviously used as a dwelling. The teacher was T. W. H. MILLER. The McGUIRE grave-yard is the oldest in the township. It is in Section 9. No burials have been made there for about thirty years. Dr. T. L. MIDDLETON preached the first sermon, in a log cabin, where the Iuka cemetery now is. Within forty feet of that spot he lies buried. Among the early preachers were: William FINLEY, Presbyterian; Joseph HELLEM, Thomas CASEY and John M. GRIFFITH, Methodist. The first church edifice erected in Iuka was the Cumberland Presbyterian. William MIDDLETON was the first justice of the peace and school trustee. Elisha WADLOW, William BROWNFIELD and James SONGER were also early justices. The first blacksmith shop was owned by and run by A. B. TAYLOR. A. O. ESTIS had the second shop, at the State road. John McGUIRE opened the first grocery store. First Mill--Thomas L. MIDDLETON built the first mill; it was on the State road, in Sec. 7; it was run by horse power, and could grind ten or fifteen bushels per day. Grinding was done for the early settlers from Tennessee Prairie to Xenia. At the above mill, in 1835, Thomas L. MIDDLETON kept the firs store. Game--Such game as prairie chickens, turkey and deer were plentiful. Bears were occasionally found. Calvin PYLES, at an early day, in chasing one of these animals on his horse, plunged over a cliff twenty-five feet in height. Fortunately he received but slight bruises. The bear was overtaken and killed. 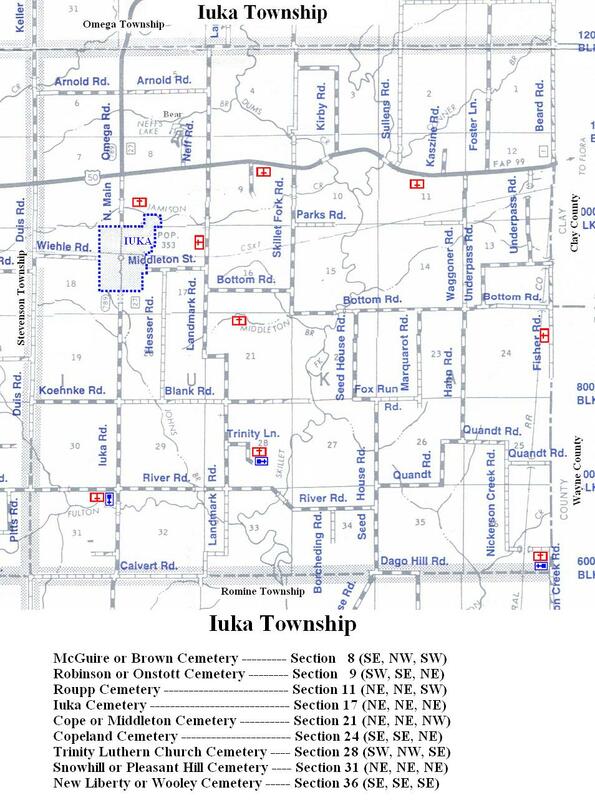 Iuka is well supplied with convenient wagon-roads. The principal one is the Vincennes. It was traveled as a mail route in early days, and it was necessary to guard the portions bordered by James COOK and William FUGET introduced the first blooded horses of the Waggoner and Gray Eagle breed. T. L. MIDDLETON, in 1840, introduced Berkshire hogs. Thomas L. MIDDLETON was the first physician; G. D. RAMSEY, William E. MIDDLETON and James DAVENPORT were early practitioners.